The pools and the park merge, creating a perfect environment to relax the mind, surrounded by the beauty of nature, in every season. The Whirpool bathtubs, the Kneipp paths, the big thermal waterfall enrich the garden giving an experience of relax, even in winter, thanks to the temperature of the water and the soft steam that it creates. 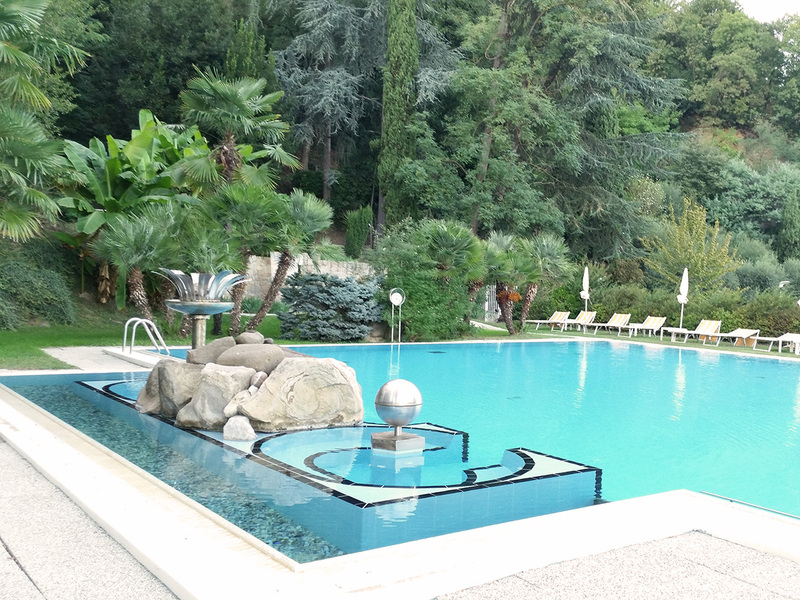 The hotel has three thermal pools: one indoor, always illuminated by the sunlight thanks to the glass walls and the large attic, and two external pools, one of them connected to the internal one through a water path. The internal pool is equipped with a seat that helps people with disabilities entering the water. Every pool is equipped with benches and hydromassage poolbeds, waterfalls for neck pain, upstream, walks on the cobblestones with whirlpools for legs and lumbar. The three pools are maintained at a temperature of 36-35°C in winter and of 34-32°C in summer, making the bathing pleasant all the year. The main activity advised inside the pools is relax! They are also the ideal place to do some physical exercise such as swimming, recommended to all ages. Every week, free courses of aqua gym take place for the guests of the hotel, and, if requested, you can have sessions of rehabilitative gymnastics. The tradition of the steam baths comes from the ancient romans’ times. The division in three areas: Calidarium, Tepidarium and Frigidarium, in continuity, guided the person through a wellbeing path using the sequential: steam, warm water and cold water. The Acqua Termale Euganea (Thermal Euganean Water) uses the natural heat of the water (about 80°C) and enhances the benefits thanks to the precious physical-chemical characteristics of it, full of trace elements such as salt-bromine-iodium.